This week's A SMALL CHAT comes all the way from Australia with talented artist, Fleur of Phunk Lab. I spotted and posted Fleur's work last summer. I loved the look of her designs and thought her prints would be a great focal point for a wall space. Let's see what she has to say about her home and how she is inspired by her own city. 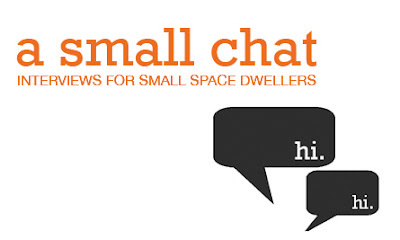 Tell us about your home - how big (or small) is it and how long have you lived there? 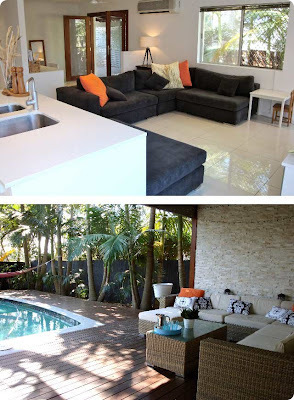 We fell in love with a 2 bedroom house on a small 506m2 block of land. Although it was smaller than we wanted for our first home it's really close to everything and we're learning to make the most of every square meter! We've been here for nearly a year now and although we've done a lot of the garden (my fiance Jeff has a landscaping business) we still have a lot to do as far as decorating is concerned. 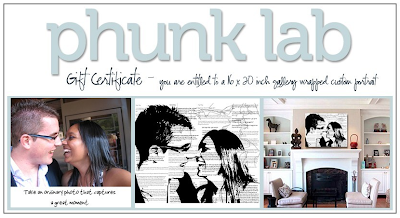 I posted about your artwork, Phunk Lab, a year ago and love it! 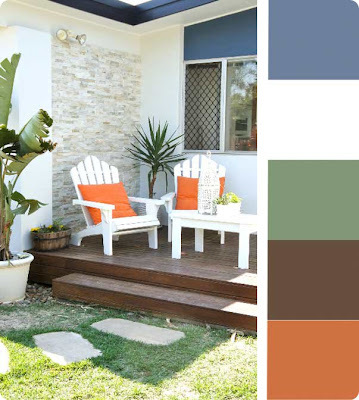 How do you feel art inspires home design? How can art influence or change the look of a space? I think you can really use art to inject your personality into a home. Personally I've found that art in our home has been like icing on a cake - we've spent the last year finding the right furniture to suit the structural layout and now I'm starting to collect art and textiles that fit in with our personal style and surroundings. I think you can't go wrong if you choose pieces you love or ones that have a personal meaning to you. I had a friend who did a round the world trip and picked out a print from every city she visited. Something as simple as a frame can influence the look of a space too. You can instantly create more of a dramatic look with a large ornate frame and contrast matting or use the same simple frames grouped to pull an array of different prints together to make somewhat of an inspiration wall. What is your best small space tip when it comes to displaying art? I have two :) 1. If you want to display a piece of art in a certain area but you're worried about it looking cluttered use a piece that either has a background or frame and matting color that is the same as the wall you're placing it on and 2. 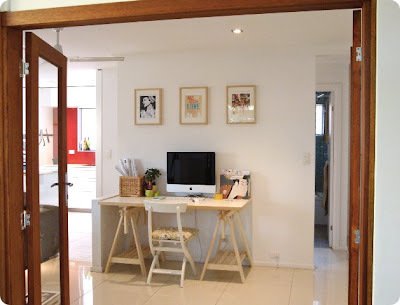 You can peg small prints, photographs and ACEO cards along a piece of Ikea curtain wire either vertically or horizontally for some instant personality in a small space. How has your city inspired your home design? We live on the Gold Coast in Queensland which is know for its warm weather and beaches. Luckily there were lovely big palms and a pool when we bought the place so our main objective was to make the most of the outdoor living. Now we're focusing on increasing the flow from the house through to the garden with french doors and bi-folds. We're planning on having our small wedding here next year so we have a good incentive to get everything done asap! Thanks, Fleur!! Check out Fleur's blog right here and the Phunk Lab etsy shop right here.